A Ukrainian military plane has been shot down in the east, amid fighting with pro-Russian separatist rebels, Ukrainian officials say. They say the An-26 plane was hit at an altitude of 21,325ft. The plane was targeted with “a more powerful missile” than a shoulder-carried missile, “probably fired” from Russia. The crew survived. Russia has made no comment. Separately, NATO reported a Russian troop build-up near the Ukraine border. Russia denies supporting and arming the separatists, and has invited officials from the Organisation for Security and Co-operation in Europe to monitor its border with Ukraine. 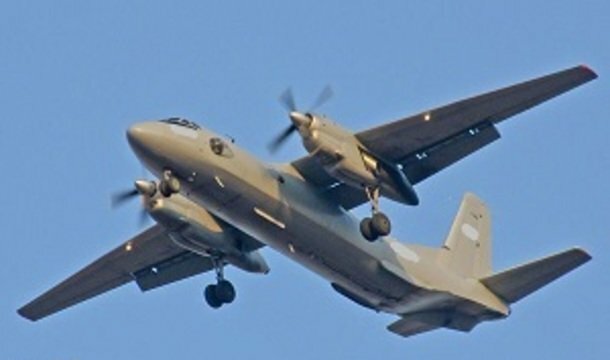 A statement on Ukraine President Petro Poroshenko’s website said the An-26 was taking part in an “anti-terror operation” in the region. The statement quoted Ukrainian Defense Minister Valeriy Heletei as saying that a search-and-rescue operation was now under way. Andriy Lysenko, a spokesman for Ukraine’s security and defense council, was later quoted by Ukrainian media as saying that eight people were on board the plane. Rebel forces earlier said they had targeted the aircraft in the Luhansk region. This comes as the Ukrainian air force said it had delivered “five powerful air strikes” on targets in the region in a bid to end a rebel blockade of a strategic airport there. Several targets were hit near the airport in the rebel-held city of Luhansk, a military spokesman said. Ukraine’s military later said the airport had been “unblocked” and the army had retaken several villages.